May 14, 2017, New York, NY - Next to Nothing Gallery is pleased to announce, This and That, an exhibition of new work from two noted New York artists, Justen Ladda and Brigitte Engler. Both artists explore transformation, process, physicality and mark-making. This and That will feature Justen Ladda’s “mirrors”, elliptical contemplations and reflections hand-painted on red cedar wood using metal leaf and resin; and Brigitte Engler’s sidewalk graffiti encaustic paintings, constructed using a frottage rubbing technique, handmade paper and beeswax. 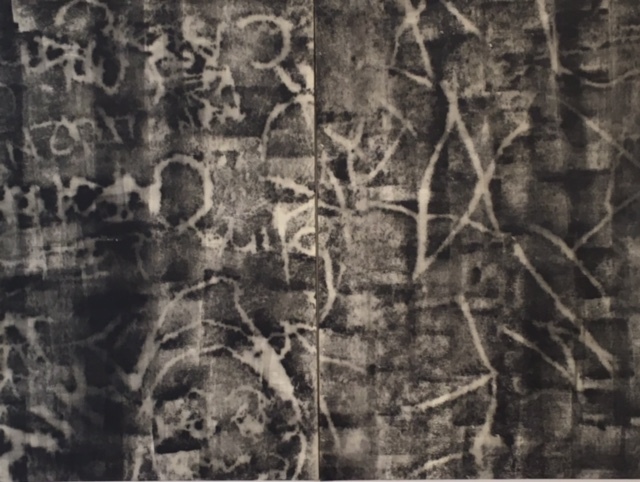 Focusing on the experience of process, Engler explored mechanical means of reproduction such as rubbings, linocuts, shibori dye, in encaustic, paper, fabric to re-present vernacular patterns, ephemeral and anonymous, collected haphazardly and opposes to the pure abstraction of thought, the physicality of here and now. Ladda aims to accentuate and draw attention to the natural grain patterns deep in wood in his reflective oval pieces. He uses a labor-intensive hand rubbing technique to accentuate the natural cedar wood grain, the patterns becomes more and more visibly apparent. The many-layered delicate application of metal leaf, paint and resin result in a shiny mirror-like finish. These contemplations and amplifications of humble subjects, explore the coming together of man, nature and the artist's eye. Ladda and Engler are interested in modernity intersecting and/or colliding into our natural and built environment, and both are influenced by the mindfulness and meditation of Tai Chi and Chinese scholar rocks. Brigitte Engler, James and the Weird Elf, 2016, 2 panels, ink and wax on Rives paper mounted on canvas, 36" x 48"
Justen Ladda has lived and worked in New York since 1978. He is widely known for his Neo-pop installations transforming commercial objects into what Ken Johnson calls “fantastic, illusory tableaus”. Working primarily in painting, installation and photography, the major themes that form the conceptual framework for his art making are change, transformation, balance and beauty. Brigitte Engler, born in Paris, has called the Lower East Side her home since she came to New York in 1980 to study at the Whitney Independent Study Program and worked as an art reporter for Paper magazine. Her work has been exhibited in group and solos shows. Several artist projects in collaboration with editor of Semiotext(e) Sylvère Lotringer were published in the US. In 2016 she collaborated with a French ecological government agency to present an immersive video and sound art installation submerged in a medieval tidal mill. This year, Engler had a one-person show at the Spring/ Break Art Show 2017/ Black mirror.